6/1/2018 - Leigh-on-Sea to West Ham and return. London Waterloo to Mortlake. Chiswick to Kew Bridge. Kew Bridge to London Waterloo. Went up to London to take pictures of bridges by the river Thames for a book I am working on. 15/1/2-18 - Leigh-on-Sea to London Fenchurch Street and return. Went up to London for an evening talk in Central London. 20/1/2018 - Leigh-on-Sea to London Fenchurch Street. London Paddington to Bath Spa. Bath Spa to Westbury and return. Went up to Bath, primarily to go to a concert at the Forum to see King King, but also to travel on some lines I hadn't been able to cover last year. 21/1/2018 -Bath Spa to Bristol Temple Meads. Bristol Temple Meads to Taunton. Taunton to London Paddington. London Fenchurch Street to Leigh-on-Sea. Came back vis Bristol and Taunton. Had an hour's break in Taunton, but was not able to exit the north side of the station through the ticket barriers as my ticket wouldn't work. So went to the south exit where it also wouldn't work, but there was an inspector there who manually let me through. Returning back to the north exit I had the same problem with a different ticket. As there wasn't anyone there I had to press the button for help and had to show my ticket onto a screen for the inspector to read before he let me through. This was a first for me, but begs the question are the ticket barriers at Taunton Station not working properly? 17/3/2018 - Leigh-on-Sea to London Fenchurch Street and return. London Euston to Quainton Road via Milton Keynes, Bedford, Hendon, Acton, Greenford, Princes Risborough and Aylesbury. Quainton Road to Reading via, Calvert, Clayton, Bicester and Oxford. Went on the UK Railtours excursion named “The Missing Link”. It covered as much as possible of the old Varsity Line between Oxford and Cambridge that is still open today. This included the Bletchley Flyover, the freight line from Hendon to Acton and the line north of Quainton Road to Calvert and Clayton. Unlike most Railtours this ran pretty much on schedule. The only thing that “went wrong” was that the line was flooded near Clayton, so we couldn’t go all the way along that stretch of line. It meant that we were about ten minutes early at Bicester so had to wait there until a path was available. The positive for me was that they allowed passengers to get off at Reading, so I was able to travel through to Paddington and so get back into London an hour earlier than scheduled. 23/3/2018 - Leigh-on-Sea to London Fenchurch Street. London Paddington to Worcester Shrub Hill. 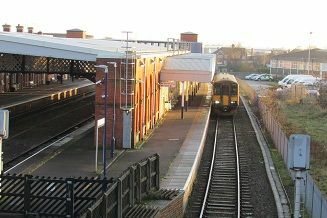 Worcester Foregate Street to Ledbury. Ledbury to Bromsgrove. Bromsgrove to Droitwich Spa. Droitwich Spa to Jewellry Quarter. Had to go to Hereford on business and as so often happens whenever I go on a GWR train out of Paddington there were problems with my journey. That makes it three times in just over a year! This time the problem was the state of some of the sleepers on the stretch of line between Ledbury and Hereford, which caused this section of the line to be closed. Consequently there would be no GWR trains to Hereford. When I got to Paddington it said the train would go as far as Worcester Foregate Street and then coaches would take you to Hereford. 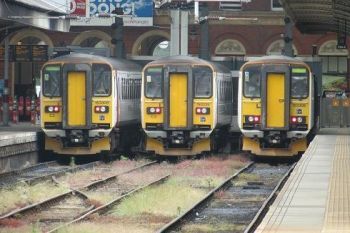 What happened in reality was that the trains were terminating at Worcester Shrub Hilll and then coaches were taking you from there to Hereford stopping at all the stations on the way. Luckily I did see that West Midlands trains were still going as far as Ledbury, so I was able to get one of these from Worcester Foregate Street. I culd then get a coach to and from Hereford which was a damn sight quicker than by going on a coach all the way from Worcester. Coming back from ledbury I went straight through to Bromsgrove where I could explore the new station with its four platforms. It was quite surreal with no one around once the passnegers had left the station. Although it does have a ticket office on the outside the entrance hall was quite dark, plus it is gateless, so no staff were standing around. Although there were plenty of CCTV cameras it seemed strange to see such a big station without any staff. Very futuristic in a negative way. It was also a little way from the town centre so it seemed a bit out on a limb for the locals. I then caught a train back to Droitwich Spoa and changed trains there getting a train north into Birmingham. I got off at Jewellry Quarter so I could get a tram into the centre and go on the newish piece of track to New Street Station which is branded as "Grand Central". 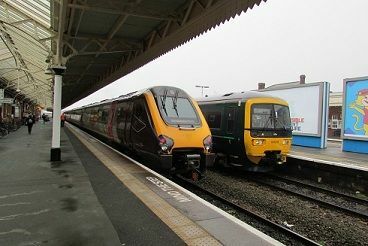 24/3/2018 - Birmingham New Street to Bristol Temple Meads. Bristol Temple Meads to London Paddington via Westbury and Newbury. London Fenchurch Street to Leigh-on-Sea. The next day I get a Cross Country train from New Street to Bristol Temple Meads, not having travelled the full length of this line since the 1970s. The four carriage train was quite empty as far as Cheltenham, but it soon filled up and by Bristol Parkway it was tanding room only. When I got off at Bristol Temple Meads, you could see that it was till very full for, though the first clss carriage was only a quarter full. Isn't it time all the TOCs got rid of 1st Class which is never ever full and a waste of space on many trains, especially at weekends? Coming back from Bristol to London my train was diverted after Bath via Westbury and Newbury so was a good forty five minutes late getting into Paddington. Sadly, although I saw several of the new Class 800's trains pass me, the ones I travelled on were good old fashioned 125's. 14/4/2018 Leigh-on-Sea to West Ham and return. London Waterloo to Twickenham. Richmond to London Waterloo. Went over to South West London to take some photos for a book I am doing on London's bridges. 21/4/2018 Hadley Wood to Moorgate and return. Canada Water to Rotherhithe and return. Canada Water to Surrey Quays. Went to the Southern Docklands area of London and to Canary Wharf to take some photos for my book on London's bridges. 28/4/2018 Leigh-on-Sea to West Ham and return. View looking north from Stafford station on 20/5/2018. 5/5/2018 Leigh-on-Sea to London Fenchurch Street. London St Pancras to Sheffield. Sheffield to Romiley. Romiley to Manchester Piccadilly via Reddish North. Manchester Piccadilly to Wigan North Western via Eccles. Went up to Manchester for the weekend, primarily to see the 50th anniversary concert of Barclay James Harvest in Manchester. Also managed to get in a few different lines in the area. I went up to Manchester via Sheffield as I wanted to go along the Peak Distrct route and stop off in Romiley on the way, where I was able to meet up with a friend I hadn't seen for forty years. I then went into Manchester, where I should have got a train to Horwich Parkway via the Bolton route, but that route was closed due to electrification work. Instead I got a Trans Peninne Express train tio Wigan North Western via Chat Moss and the line linking this route with the West Coast mainline. 6/5/2018 Wigan Wallgate to Southport. Southport to Manchester Oxford Road via Eccles. Manchester Oxford Road to Manchester Victoria. 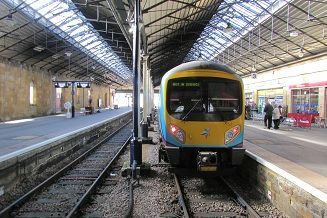 Manchester Victoria to Todmorden and return. Manchester Victoria to Stalybridge. Stalybridge to Manchester Oxford Road. The next morning, using a Manchester area Wayfarer ticket, I went first from Wigan to Southport and back. Then on into Manchester via the same route I had come along yesterday. Interestingly enough the train went on a little used line from Wigan Wallgate onto the West Coast mainline. 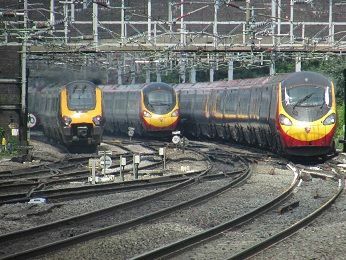 I then caught a train from Manchester Oxford Road round the new Ordsall Curve to Manchester Victoria and onto Todmorden. The train itself was going all the way to Leeds. After coming back into Manchester I then caught a train out from Victoria to Stalybridge and then back to Oxford Road, before going to the concert in the evening. 7/5/2018 Manchester Piccadilly to Crewe via Manchester Airport. Crewe to Derby. Derby to London St Pancras International. London Fenchurch Street to Leigh-on-Sea via Tilbury. The next morning on my return, I first caught a train to Manchseter Airport and onto Crewe, before going across to Derby via Stoke. Then I caught an East Midlands train back to London. 13/5/2018 Rayleigh to London Liverpool Street and return. London Liverpool Street to Cambridge and return. Went up to Cambridge for the day. I could have gone from Kings Cross non stop to Cambridge via Letchworth but the fare was about three times as much as going from Liverpool Street. Plus the route is a lot more interesting in my opinion. 18/5/2018 Leigh on Sea to London Fenchurch Street. London Euston to Stockport. Caught a Virgin Train up to Stockport for the weekend. Although it said on the indicator at Euston that my carriage was full, there were plenty of seats all over the train. Plus for a change I was given a table seat facing forwards as per my request. 19/5/2018 Stockport to Carlisle via Manchester Victoria, Preston, Carnforth and Workington. Carlisle to Stockport via Appleby, Clitheroe, Blackburn, Chorley and Manchester Victoria. Went on the Statesman run train originating at Nottingham going to Carlisle via the Settle & Carlisle line. Although on the website we would go up to Carlisle via the S & C and then come down via the Cumbrian Coast line, due to Network Rail interference, we went the other way round. I think it worked better as we were able to see much of the coast from a forward facing northern going train, including the coast of Scotland on such a fine day. Coming back the weather was again fine, so we could see the lovely scenery of the S & C. The driver even slowed down as we went over the Ribblehead Viadust so everyone could get a good photo. Going up we were about fifteen minutes late arriving in Carlisle, so we were only there for one hour and twenty five mniutes, which was clearly not enough time to enjoy our visit. I felt sorry for the folks having the evening meal as we left at 15.05 and they were serving the meal almost as soon as we left Carlisle! 20/5/2018 Stockport to Stafford. Stafford to London Euston. London Liverpool Street to Rayleigh. Had a pleasant journey back to Essex, going ifrst on a very crowded Cross Country train to Strafford, over the Norton Bridge flyover for the first time, and then an averagely full Virgin train to London. Again we were given table seats facing forward as per my preference when buying the tickets. But both times when we got on the train there was someone sitting in our seats. Luckily my presence made them move pretty quick! 28/5/2018 Leigh-on-Sea to West Ham and return. Kensington Olympia to Imperial Wharf. Imperial Wharf to Clapham Junction. Clapham Junction to London Waterloo. Went up to London to an exhibition at Olympia. 30/5/2018 Boston to Grantham and return. Drove up to Kings Lynn and then onto Boston where I caught a train to Grantham and back. 9/6/2018 Rayleigh to Shenfield and return. Shenfield to Colchester. Colchester to Norwich. Norwich to Great Yarmouth via Berney Arms. Great Yarmouth to Norwich via Acle. Norwich to Lowestoft. Lowestoft to Ipswich via Beccles. Ipswich to Chelmsford. Chelmsford to Shenfield. Went up to Norfolk for the day, mainly to visit the Wherry Lines and go to both Great Yarmouth and Lowestoft which I hadn't done for over ten years. My train fare to Norwich from Rayleigh was a mere £7.90 each way (with a Senior Railcard), plus I bought an Anglian Lines Rover for just £12.50 which meant quite a chap day out. All my connections were on time, so no misssed trains anywhere. I was originally planning to go to Lowestoft first and then Great Yarmouth, but in the end I did it the other way round, so I could return on the Suffolk Coast line. This was a blessing in disguise as if I had gone to Yarmouth second, my planned train back to Norwich was cancelled, so I would have been stranded there and miss my train at Norwich back to Shenfield. A bonus was that they had had class 37's hauling some Yarmouth services so I was able to be hauled by one of these on the 13.18 service. It was actually quite full and went non stop via Berney Arms. 24/6/2018 Isfield to Worth Halt and return. Northam to Tenterden Town and return. Northam to Bodiam and return. Had a pleasant day out in Kent and East Sussex visiting two preserved lines in one day. The first visit was to the Lavender Line which we should have gone to a couple a years ago, but we were let down by the local buses not going there. We should have left at 11.00am but were waiting for the fireman who had been involved in a cycle race earlier that morning, according to his wife! When we did eventually go, it was in a brake van - a first for me, though only for about a mile, such is the shortness of track on this railway. Then we drove for about an hour across East Sussex to Northam where we caught a train almost immediately to Tenterden, on the Kent & East Sussex Railway. There was a bus rally on at Tenterden station, so we viewed these before going into the museum and then coming back right through to Bodiam. 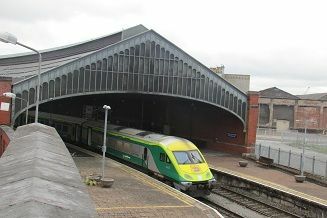 We then got off the train back at Northam where we had a pleasant cup of tea on the platform, watching the train depart. Very relaxing and enjoyable. Interesting to note that there are several holiday coaches next to the station at Northam, as well as a hairdressers in another preserved coach. A lovely preserved country railway station in a pleasant setting in the middle of nowhere! Went back up to Norwich for the day with my wife and two friends, just six weeks after making exactly the same jiurney for exactly the same price of £7.90 each way. 30/7/2918 Leigh-on-Sea to London Fenchurch Street. London Euston to Glasgow Central. Glasgow Central to Prestwick International Airport. Prestwick International Airport to Ayr. Ayr to Glasgow Central. Glasgow Queen Street to Charing Cross. Went up to Scotland for a few days covering some of the suburban lines in the Glasgow area plus going on a trip to Inverness. Went first class as it was only £10 more than a standard ticket. This meant that I was able to go in the 1st class lounge at Euston and help myself to "free" coffee/tea, biscuits and fruit whilst I waited in the lounge. The funny thing was that I got two texts from Virgin telling me that my train was almost ready and then that is was in platform 12. Unusually for a long distance train at a London terminal we were allowed onto the train a full fifteen minutes before departure. For once I was given a seat facing forward which had a little table complete with cup and glass ready for the free breakfast which they serve almost as soon as we leave Euston.i had the veggie option which was hash potatoes with mushroom plus a veggie sausage that tasted like cardboard ! They served me tea and juice before my meal arrived but it had all been drunk before the food arrived. Though I did get more tea once the plates have been cleared away. At Preston there was a crew change and most of the new crew are Scottish.the only problem was there was no driver and we had to wait 15 minutes for him to arrive on a different train which meant we are fifteen minutes late when we eventually left. They gave me lunch as we started to go through the Lake District north of Oxenholm. I had virtually the same meal as I had for breakfast mushroom and potatoes hash, only this time it was in an ice cream type carton. For some reason I missed out on a pudding which should have been a fruit salad. Still I got an extra bottle of water when I asked for it. We arrived at Glasgow Central almost half an hour later than the time stated when I booked the ticket. This was partly due to the crew change. It was then a quick rush to the ticket office to buy a return to Ayr and then onto the 14.30 departure with just a couple of minutes to spare. This was a journey I should have been making on Wednesday morning before returning back south, but due to engineering works still taking place on the routes I wanted to go on east of Glasgow I did a swap. See Wednesday 1st August for the lines I covered. The train I caught was a semi fast missing out most of the stations between Glasgow Central and Kilwinning. I got off at Prestwick International Airport station to take some pictures for a future book on airport railway stations and then got the next train onto Ayr. There was a lot of work going on in and outside the station so we had to go out of a different entrance due to the main entrance being shut. Once I had done all I wanted to do in Ayr I caught a train back to Glasgow Central which was pretty full all the way. At Glasgow it was rush hour and very busy. I walked round to Glasgow Queen Street and then caught a train with all the homeward bound commuters just one stop to Charing Cross where my hotel was situated. 31/7/2018 Charing Cross to Glasgow Queen Street. Glasgow Queen Street to Perth. Perth to Inverness. Inverness to Stirling. Stirling to Falkirk Grahamston. Falkirk Grahamston to Dalmeny. Dalmeny to Haymarket. To Glasgow Queen Street. Glasgow Queen Street to Charing Cross. Next morning I did the same journey in reverse and then got the 8.30 a, train going to Aberdeen as far as Perth where I changed trains onto the Inverness train. Perth is such a large station, with so much of the building nit being used I guess. But in its heyday I would guess it would have been a very interest station. My journey to Inverness was uneventful and the train ran on time. For some reason I wasn't able to reserve seats on both these journeys, but did manage to get a table seat facing forwards, so I was happy. The copy of my fare from Queen Street to Inverness was a mere £5.50, with my senior railcard discount. I had around fee hours in Inverness before returning south. Once again I didn't have a seat reserved, but I was able to get onto the platform as soon as the barriers went from red to green and get a table seat in the first carriage. This time the rain a 3 car class 158 was full to bursting. It's a pity they put more carriages on these trains in the summer months with all the extra tourist trade. I then got off at Stirling for a brief ten minute wait, before getting the train to Falkirk Grahamston, where I changed onto a Glasgow Queen Street to ? train, the reason being I wanted to cover the rare piece of track between Linlithgow and Dalmeny. The train I get only runs once a day I believe in this direction, but it was pretty empty after Linlithgow as the Glasgow commuters returned home. I got off at Dalmeny, where I walked down to the shoreline to take pictures of all three Forth bridges. I then returned from Dalmeny to Glasgow Queen Street via Haymarket, where I could have caught three trains to Glasgow, all within twenty minutes of each other, going on three different routes! 1/8/2018 ? Charing Cross to Glasgow Queen Street. Glasgow Central to Lanark. Lanark to Motherwell. Motherwell to Cumbernauld. Cumbernauld to Argyll Street via Hamilton Central. Glasgow Central to London Euston. London Fenchurch Street to Leigh-on-Sea. The next day I caught the 08.50 train from Glasgow Central to Lanark. As it was before 9.00am I bought a single to Cambuslang and then was able to use my Day Tripper rover ticket. This gives you unlimited travel in the Strathclyde area for just ?12.00. The only trouble was that I had just half a day to make use of it. So I managed to fit in visits to Lanark, Motherwell, Cumbernauld, Hamilton and back into Galsgow, getting off at the underground station of Argyll Street. I then caught the 13.50 train back south to Euston form Glasgow Central. The journey was uneventful with most of the passangers around me sleeping. I was back at Leigh-on-Sea at 7.30pm after a busy but enjoyable railway trip to Scotland. 20/8/2018?? Cobh to Cork and return. On a cruise to Ireland and Iceland. The ship docked at Cobh (formerly known as Queenstown) and in order to get to the nearest big city of Cork it was quite convenient to catch a train from the station which was situated right next to the dockside. The journey took about half an hour and cost ten euros return. Luckily they had decided to put four carriages on the train as many people form the ship had the same?idea as us. A couple of days later we visited Dublin and managed to go on the newish tram from The Point into the centre. I also had a short trip over the River?Liffey on one of the DART trains to Dublin Connolly station where trains depart for the north and north west. Chinnor to Princes Risborough and return. Wallingford to Cholsey and return. d a pleasant day out visiting two preserved lines, which are just ten miles apart. 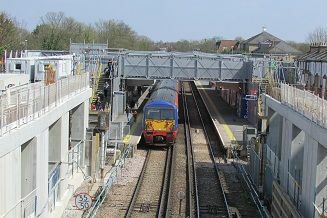 We went first to the Chinnor and Princes Risborough Line which now runs into Princes Risborough Chiltern mainline station. The added attraction was that for that weekend it was only £5 for anyone over 60. This did bring the crowds in and it was pretty busy. We then drove ten miles across Buckinghamshire into Oxfordshire where we went for a ride in the Chelsey and Wallingford Railway at Wallingford. What a difference! There was just a handful of passengers on our train which was hauled by one of their resident shunters. What a shame that it isn't busier. The fact that it is connected to the Great Western mainline to Bristol is a wasted opportunity. They could have signs which say "Change her for the Chelsey and Wallingford Railway" as they do at Bodmin Parkway and at Paignton stations. 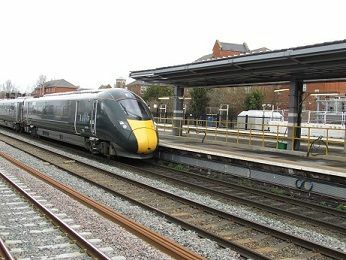 Also the destination of Wallingford as a place to visit by train could be pushed more especially with lots of potential customers less than an hour away in London. 16/9/2018 North Weald to Ongar and return. Took my two grandsons for a visit to the Epping and Ongar railway which I have visited on two occasions. 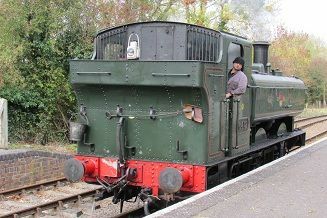 It was a diesel weekend which was fine, especially as the sole remaining Clayton in preservation was running that day. We went to Ongar from North Weald hauled by 37??? . On the return we were hauled by the Clayton as far as North Weald. Then a class 20 was meant to take us into Epping, but it had broken down . After waiting twenty minutes we gave up and went and had our lunch before going on one if the preserved buses to Epping and back. 23/9/2018 Colne Valley Railway. Went with the two grandsons to the Thomas Day Out event at the Colne Valley Railway. In spite if the rain it was an enjoyable day out, well organised with plenty of trains running all through the day. Also there were lots of other events going on like story telling, train sets to play with and a model railway. 28/9/2018 Leigh-on-Sea to London Fenchurch Street. London Kings Cross to York. York to Thornaby. Thornaby to Newcastle Central. Newcastle Central to Darlington. Darlington to Middlesbrough and return. Went up to Newcastle via the coastal route through Hartlepool and Sunderland. My train was almost ten minutes late into York being held up at red lights on the way up. This meant I missed my connecting Trans Pennine train to Middlesbrough. So it was another hour wait. I went to the ticket office to see what could be done about my booked ticket for the 11. 38 train. She just wrote something on the back of my ticket which she said would mean I could get the 12.38 train with nothing extra to pay. So when I got the 12.38 train the guard was fine about it when he checked my ticket,so no problem there. Of course this train was held up at more red signals on the way, so it was 50/50 whether I would catch my connection to Newcastle at Thornaby, but luckily I had two minutes to spare. The train I got was an overcrowded Pacer unit, which did empty at Sunderland, but it was lovely scenery of the North Sea coast once you got away from Teeside. I then came back down from Newcastle to Darlington and went over to Middlesbrough on another Pacer to cover the line between Darlington and Middlesbrough. This was another tight connection with just two minutes to go under the subway from one platform to the other and involved me running for a change, but I just made it. 30/9/2018 Darlington to Leeds. Leeds to Harrogate. Harrogate to York. York to Scarborough and return. York to London Kings Cross. London Fenchurch Street to Leigh-on-Sea. Due to strike action by Northern staff I had to rearrange my schedule this morning. I was going to change at York, go down to Leeds via Harrogate and then come back up to York, before going to Scarborough and back, but as so many trains had been cancelled I went instead straight to Leeds, where I had a five minute change to get a train up to Harrogate. This train terminated there, so I had half an hour to have a quick explore of the town before catching the next train through to York. It was quite crowded but luckily there were four carriages, so there was just enough room for everyone. At York I should have just missed a Trans Pennine service to Scarborough, so it should have been nearly another hour's wait for the next one. But as we came into our platform at York the TP train was till in the platform next to one, so after a quick dash round to it, I was able to get in that one. This train was even more crowded but I was able to get a seat going backwards. The advantage was that I was able to have an hour in Scarborough instead of just ten minutes, which was better than hanging around York station for an hour. Coming back to York the TP train from Scarborough was even more crowded than going! It is a pity that TP only out on three carriages on these Saturday trains rather than four or even six, which would help ease the overcrowding. On returning to York it was just a ten minute wait before I was able to get my Grand Central service back down to London for a mere £7! Again this train was crowded but as I had a booked seat, I was able to sit all the way. 13/10/2018 Leigh-on-Sea to London Liverpool Street and return. Moorgate to Highbury and Islington. Went up to London to see Barclay James Harvest (John Lees' version) in concert in Islington. As my train was one of those that goes into Liverpool Street at weekends I tried going on the Great Northern Line from Moorgate to Highbury & Islington rather than going by tube. A mistake I think as I was waiting for almost fifteen minutes at Moorgate before we eventually left. 22/10/2018 Leigh-on-Sea to West Ham and return. London Bridge to Petts Wood. Petts Wood to Bromley South. Bromley South to Ashford International via Maidstone East. Ashford International to Stratford International. Went down to Kent to cover the line from Swanley to Ashford via Maidstone East. Rather than go all the way into London to catch a train from Victoria I got off at West Ham and went through to London Bridge on the Jubilee Line. I then went on a roundabout route to Petts Wood and then back to Bromley South before catching the train I could have got a Victoria. Coming back I came through to Stratford International which is so much quicker than via Tonbridge at just thirty minutes. Plus I don't have to go all the way into Central London, being able to go down to West Ham from Stratford where I can change onto my C2C train. 10/11/2018 Leigh-on-Sea to London Fenchurch Street. London Euston to Manchester Piccadilly. Manchester Piccadilly to Huddersfield. Huddersfield to Leeds. 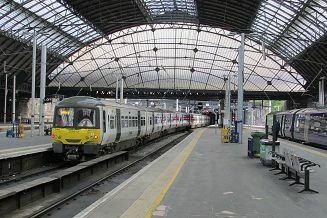 Leeds to Liverpool Lime Street via Manchester Victoria. Liverpool Lime Street Low Level to Liverpool Central. Liverpool Central to Liverpool South Parkway. Liverpool South Parkway to Liverpool Lime Street. Quite an interesting set of railway journeys with an eventual destination of Liverpool where I was attending a reunion. I went to Manchester first to catch a train over to Leeds and back via Huddersfield. I was originally going to catch a train from Huddersfield to Halifax and back to cover that piece of track, but due to the strike action of Northern Train guards/drivers there were no trains at all on that line. So I elected to go to Leeds instead. The train I got from Manchester Piccadilly was a stopping train all stations to Leeds, but for some reason my ticket said change at Huddersfield rather than staying on it all the way to Leeds!. It left on time, but was very full due to the cancellation of a previous Trans Pennine service. It also had a lot of football fans on board making their way to the Huddersfield vs West Ham match. I had forgotten how lovely the scenery on this route is between Stalybridge and Huddersfield. In fact I would say it is one of my favourite train journeys in Britain. By the time we got to Huddersfield though the train was a good ten minutes or so late, due to being held up at various stations on the way, possibly due to a late running train in front of us. According to my schedule I had just under fifteen minutes at Leeds to catch my return train back across the Pennines straight to Liverpool. I should have stayed on the slow train all the way to Leeds and would have been alright for connections. Instead I did get off at Huddersfield, partly to take some photos and partly because I believed the non-stop train to Leeds that I would be getting would overtake the slow train. It didn't of course, but it was much quieter and faster apart from slowing very so often for the slow train in front of it. The outcome of all this was that I had just under two minutes to change platforms at Leeds onto my returning Trans Pennine train back to Liverpool. As we came into Leeds I could see it on the platform and it was a very mad dash up and down stairs to make it by the skin of my teeth. I suppose I could have got a later one, but my ticket was for this train only and it would have put out my schedule in Liverpool if I had missed it. Anyway after a few minutes I did get my breath back and settled down for the return journey which passed without incident and was on time arriving at Liverpool Lime Street. I then got an underground train, ie a Merseyrail train to Liverpool central and then caught a train down to Liverpool South Parkway via Brunswick on the old Liverpool central to Manchester Central route. At Liverpool SP I was able to take a few pictures for a future book and then get an unexpected Northern service straight back to Liverpool Lime Street. 11/11/2018 Liverpool Lime Street to Runcorn. Runcorn to London Euston. London Fenchurch Street to Leigh-on-Sea. 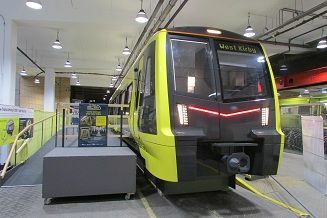 Before I left Lime Street I went aboard one of the new Merseyrail trains coming into service in 2020. It was a whole carriage with driver cab which you could walk into and ask questions from the volunteers aboard. I then caught a Virgin train as far as Runcorn, only a fifteen minutes journey through the Liverpool suburbs. The purpose being to take some photos of the new Mersey Gateway Bridge. I was planning to take a taxi from the station down to the shoreline, but there weren't any, so I walked there. It wasn't too bad getting down to the shoreline as it was all downhill, but by the time I'd taken my photos I had just under half an hour to walk the mile or so back to the station. A lot of swift walking got me back to Runcorn station with just five minutes to go to catch the next virgin service south to London Euston. I was pleased to say that they observed a two minute's silence on the train at 11.00am soon after we left Runcorn on the 100th anniversary of the Armistice. The only other thing of note was that I felt quite sick for most of the journey. Not the tilting of the train I may add, but I put it down to the cup of tea I had from the buffet. I reckon some of the milks I had may have been off. You really don't know how long these pre-packed tubes of milk had been there. I shall be more careful in future. 16/12/18 - Leigh-on-Sea to London Fenchurch Street. London Kings Cross to newark Northgate. Went up to Lincoln to go to a concert by the group King King, staying overnight. 17/12/18 Lincoln to Grimsby Town and return. Grimsby Town to Cleethrorpes and return. Lincoln to Doncaster via Gainsborough Lee Road. Doncaster to London Kings Cross. London Fenchurch Street to Leigh-on-Sea. Returned to Essex the next day, but first whilst I was up in Lincoln went over to Grimsby and Cleethorpes. On returning to Lincoln saw that there was a Northern train that goes from Lincoln to Leeds via Nottingham. Quite an unusual working. Came back on the often forgotten route to Doncaster from Lincoln via Gainsborough. No problems on my railway journeys this weekend.